“Filipinos are innately entrepreneurial,” says Sherill Quintana, CEO of Oryspa. 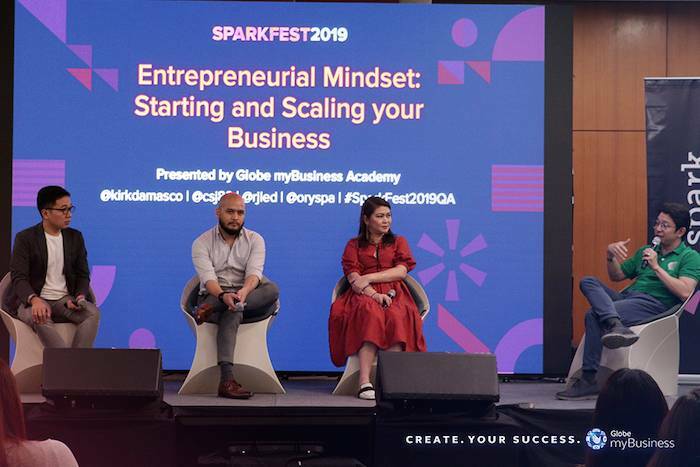 Quintana is one of the panelists at the Sparkfest 2019, a symposium on entrepreneurship held last March 23, 2019 at The Globe Tower in Bonifacio Global City, Taguig. The statement gains more significance in the digital and information age, as technological innovations and social media have made it easier for aspiring entrepreneurs to bring their business ideas to life. It’s one thing to start a business, but growing and sustaining it is something that most fail to do. In a series of lectures, creative entrepreneurs talked about the ways aspiring business owners can equip themselves for the grind of managing a business. Here are some insights. Always go back to your purpose. Before entrepreneurs can even aspire for bigger things, they first need to answer an often-overlooked question: “Why?” Your answer to this question will carry you through the tough times of managing a business. In his lecture titled “Finding Meaning in Everything We Do,” Worship Generation founder Kirk Damasco shares that work can be meaningful if you consider it as a gift, a means for growth, and an opportunity to give back to others. Understanding your purpose fuels your drive to pursue your goals, and spells the difference between feeling fulfilled or miserable in your chosen path. Successful entrepreneurs got to where they are because they pounced on opportunities, and they learned from the inevitable failures they experienced along the way. This is what contributed to the success of Christian San Jose, a UX consultant and designer whose clients include NBA superstars Kobe Bryant and Dwayne Wade, and famous singer-songwriter Usher. In his talk “Fake It Until You Make It (And Until You Become It),” San Jose shares that saying yes to opportunities opens up endless possibilities, which in turn enables you to keep learning and improving. The drive for continuous learning is an essential key to growing one’s business and taking on hurdles that come with being an entrepreneur. Find the right people to work with. Aspiring entrepreneurs often go into business to escape the corporate world. According to the panel discussion called “The Pains and Gains of Being Your Own Boss,” having that mindset sets you up for failure, as being your own boss entails greater responsibilities like managing your staff and the company’s finances. Lester Cruz, head ofSerious Studio, says a startup’s success hinges on finding the right people in terms of complementary skill sets and cultural fit. “Take your time in hiring,” he cautions. Cruz shares that an ideal startup should consist of a visionary, an operations head, and an organizer, as their defined roles will prove to be the stabilizing force for the business. Starting a business is hard, but sustaining it long-term is much more difficult. The panel discussion called “Entrepreneurial Mindset: Starting and Scaling your Business” talks about knowing when your business has achieved success, and the best time to expand it. RJ Ledesma’s drive to sustain his businesses is tied to how he starts one—by turning challenges into inspirations. He regards entrepreneurship as identifying a problem and providing a solution, as he did when he founded Mercato Centrale to address the lack of a food market in Metro Manila. Because he defined his purpose as such, he remains determined to grow his business and eventually diversify into other ventures. In terms of expanding, Oryspa’s Quintana says there’s only a small window of opportunity for a business to expand, so identifying the right time to do so is key. “If you feel that your team can already survive without you, then that’s the time to expand,” she notes. Entrepreneurs often make the mistake of expanding when the structure of their business isn’t stable yet, which leads to mismanagement and a host of other problems. Knowing how to market your product is instrumental for your business to flourish. Anna Oposa’s lecture titled “Good Seatizenship” touches on a number of tips on launching effective marketing campaigns. As the Chief Mermaid of Save Philippine Seas, Oposa’s unique campaign strategies embolden people to join her cause of environmental conservation. “Campaigns have to be something you can relate to on a personal level,” she says. Compared with the in-your-face style of other environmental groups, her campaigns rely heavily on humor and wit—a key factor in drawing younger people to her advocacy. This shows that merely showcasing your product won’t guarantee customer engagement; infusing it with a relatable and sympathetic narrative will. Create meaningful social media content. In this digital age, there’s no doubting the power of social media as a useful tool for aspiring entrepreneurs. However, in “Creating Effective Social Media Strategies,” TV host Bianca Gonzalez-Intal, She Talks Asia and Mano Amiga co-founder Lynn Pinugu, and Oposa remind entrepreneurs to strive to produce meaningful content. “Social media is just a mirror to what we do in real life. It simply amplifies our advocacies,” says Pinugu. Gonzalez-Intal adds that having an authentic voice is important, as people usually respond to someone who exudes a genuine air. As an entrepreneur, you must know the target audience well in order to create content that will resonate with them. Sustainability in business should be the norm, argues the panelists of “SustainABILITY: Creating Conscious Businesses.” In fact, defining what sustainability is for your brand should be the first step. Anya Lim of Anthill Fabric Gallery says entrepreneurs should think of how they can use today’s resources to provide for future generations. Anthill, a social enterprise she founded, does exactly that: promoting locally made, hand-loomed fabrics, and providing livelihoods to weavers in various regions. Businesses should also seek to disrupt established systems, especially those that marginalize certain groups. Enzo Pinga’s social enterprise, Earthbeat Farms, was created to empower farmers by providing them with access to market, promoting sustainable practices, and helping younger generations see agriculture as a viable profession. The issue of sustainability is all the more important for big companies like Globe Telecom, which has since moved away from purely philanthropic ventures to using its technological resources to make a meaningful impact in society. According to Globe Citizenship Head Miguel Bermundo, the company’s goal of turning a profit remains, except there’s a higher priority placed on enacting purposeful change through social programs that address the issues of poverty and connectivity. To get more tips on jumpstarting your business, sign up to Globe myBusiness Academy today.